Suspect In Kalamazoo Shootings Charged With 6 Counts Of Murder : The Two-Way Jason Dalton, who police believe killed six people in a series of shootings late Saturday night, was also charged with two counts of assault with intent to commit murder and eight firearms charges. 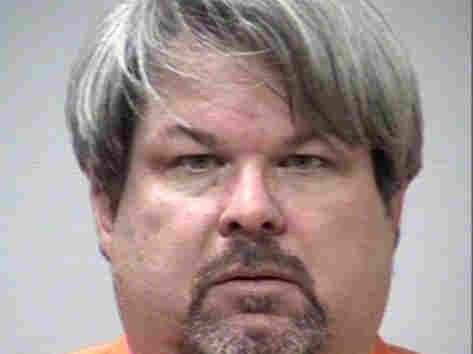 Jason Dalton, the man police believe killed six people in a series of seemingly random shootings in Kalamazoo, Mich., late Saturday night, was charged Monday with six counts of murder, two counts of assault with intent to commit murder and eight firearms violations. Michigan Radio's Rick Pluta reports from the Kalamazoo County courthouse that "prosecutors say that Mr. Dalton admitted to the killings after he was read his rights and so it seems like they're ready to move along pretty quickly." Dalton, a 45-year-old Uber driver, appeared via video at the arraignment hearing. He wore an orange jumpsuit and sat silently while the judge read the 16 counts against him. When the judge asked him if he understood the charges, Dalton answered, "Yes, sir." The judge then asked Dalton if he had anything he wished to tell the court about his connection to the community, to which Dalton responded, "I would prefer just to remain silent." Dalton was denied bail, and his next court appearance is expected to be a preliminary examination set for March 3. "Michigan State Police believe Dalton is the man who fired around 10 shots outside an apartment complex around 5:42 p.m. ET, wounding a woman who is now listed as being in serious condition. "The violence continued more than four hours later, when a father and son — Richard Eugene Smith, 53, and Tyler Daniel Smith, 17, both from Kalamazoo — were shot and killed at the Seelye Ford Kia car dealership. "That shooting was reported at 10:08 p.m. Minutes later, the third shooting was reported, at a parking lot of a Cracker Barrel restaurant. That's where police say four women were killed after two vehicles — a Chevrolet Cruze and an Oldsmobile Silhouette minivan — were fired upon." The names of the four women were released Sunday: Mary Lou Nye, 62, of Baroda, Mich. (driver of Oldsmobile minivan); Mary Jo Nye, 60, of Battle Creek, Mich. (driver of Chevrolet); Dorothy Brown, 74, of Battle Creek, Mich. (rear driver-side passenger of Chevrolet); Barbara Hawthorne, 68, of Battle Creek, Mich. (rear passenger-side passenger of Chevrolet). A 14-year-old girl who was a passenger in the Chevrolet survived the shooting and is in critical condition.